With hymns, speeches, tears and cheers, 104 high school seniors picked up their diplomas and wrapped up their time at Trinity School on Saturday, June 9. 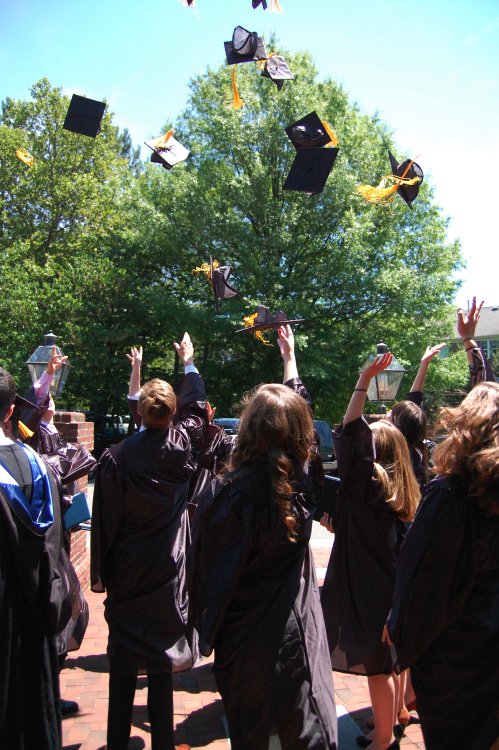 Their graduations took place within a few hours of each other on the three campuses of Trinity School: in Falls Church, VA, Eagan, MN, and South Bend, IN. In her valedictory at the Meadow View campus, graduate award winner Julia DeCelles-Zwerneman compared graduation day to a moment in the development of a human embryo, termed “gastrulation.” The embryo, at seven to ten days old, reforms itself into three layers: primitive versions of the human digestive system, nervous system and the muscular and circulatory systems. The embryo also takes on a surprising shape--that of a doughnut. "This day is very much like the day we became doughnuts," Julia told her fellow graduates. "On that day we were being equipped with the physical tools necessary to function as human beings. Today marks the day we are finally equipped with the intellectual and spiritual tools necessary to begin our work for Christ." In May, Meadow View's senior class raised more than $6,000 for International Justice Mission (IJM), a human rights group that frees modern-day slaves. (The money covered the costs of freeing one slave, according to IJM.) 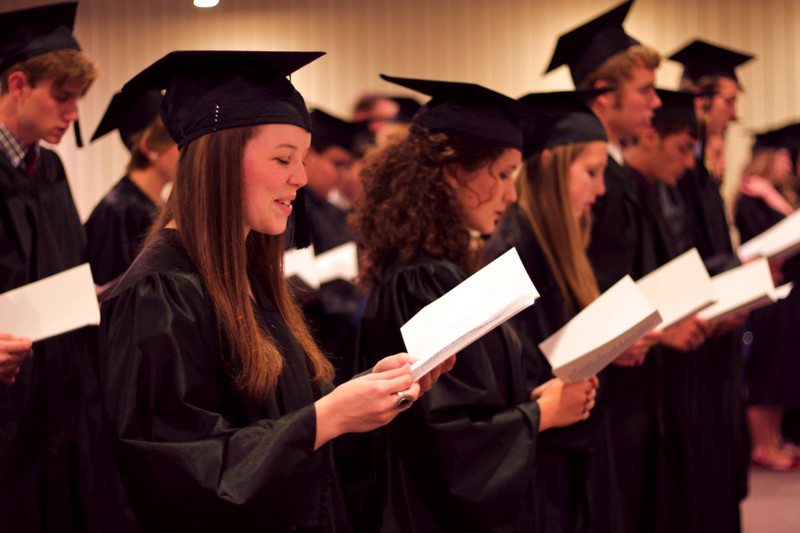 At graduation, they were treated to a speech by Bill Clark, IJM's vice-president for advancement. Since 27 million people are currently living as slaves, he said, Trinity graduates are "entering a world that is desperate for courageous and Christlike leaders." The commencement ceremony at River Ridge took on both somber and celebratory tones. The graduates remembered Alex Maslow, son of Mike and Kathy Maslow (Servant Branch), who died in the summer of 2010 and would have graduated from River Ridge this year. Another River Ridge student, Johnny McClure, a sophomore and brother of one of the graduates, died unexpectedly in his sleep last November. In his valedictory, graduate award winner Joshua Koletar reflected on Alex's death and on the limits of human reason: "[After Alex's death] I tried to rely upon my reason to comprehend my world, and it failed me." When reason comes up short, Joshua said, love offers a way forward. "Through the grace of God we have been equipped with a capacity to transcend reason. This capacity is our ability to love. . . . Love sustains us in our direst circumstances and connects us with something greater than ourselves." This year is also the 25th anniversary of the River Ridge campus, and Kerry Koller (South Bend), president and one of the founders of Trinity Schools, came to River Ridge to mark the occasion. He thanked former Servant Branch principal branch coordinator Louis Grams, along with the rest of the coordinators and members of the branch for their efforts in helping to get the school going. Kerry also gave a talk to the graduates that brought together literature, physics, philosophy and Scripture, not to mention photons, gamma rays and gluons, the origins of the universe, human evolution and the development of writing. "The development of writing had a greater impact on the evolution of human society than any other invention," Kerry said. Writing allowed humans to create governments, currency, contracts and corporations, and, crucially, it allowed the word of God to be written down. On the pages of Scripture, humans can come to see and understand "the fundamental narrative of all reality." Trinity has offered its graduates a glimpse of that reality, revealed in Scripture and in the natural world, Kerry said. At Greenlawn's commencement, graduate award winner Katherine Couch said in her valedictory that seeing a play, Arthur Miller's All My Sons, had convinced her of the importance of living a good life. 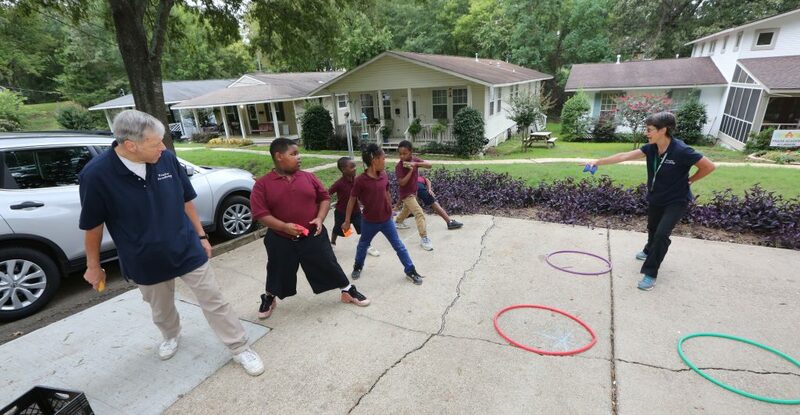 "All My Sons instilled in me a fierce desire to be better and to better the world through my choices," she said. Katherine plans to study international relations and become a diplomat or a translator. She noted, "A good life doesn't have to be something flashy. It could be raising a family with love. It could be teaching high school. It could be painting or dancing or singing." Dr. Peter Kilpatrick, Dean of the College of Engineering at the University of Notre Dame, urged Greenlawn graduates to overcome their fears by maintaining a personal prayer time. "Your conversation, your dialogue with God on a daily basis is the most important thing you will do in your life," he said. Of Trinity's 104 graduates, 89 plan to attend college this fall. The colleges they will attend include Johns Hopkins, the University of Notre Dame, the University of Chicago, the University of Virginia and the U.S Military Academy at West Point. Several of the graduates opted to defer college in favor of military service, charitable service or missionary work. Soon, these Trinity grads will be serving in Belgium, England, Costa Rica, Grenada, Nicaragua and the Philippines. River Ridge: Joshua Koletar, Meg Thompson. Congratulations to all the Trinity graduates of 2012! You make us proud. Dr. Peter Kilpatrick's comment,“Your conversation, your dialogue with God on a daily basis is the most important thing you will do in your life” is simple yet so profound! "Lord, hear the cries of your people!" Lord bless and guide all of the 2012 graduates. Praise God for our full, rich life! Give all of these students "MORE, LORD!" in all their future endeavors. Congratulations to all our Trinity graduates. 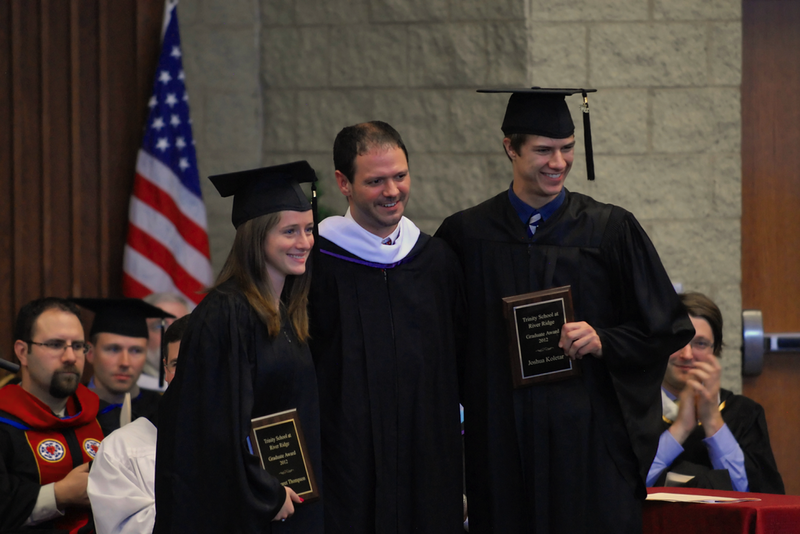 It is no small accomplishment to graduate from a Trinity school! We are blessed by your achievements and blessed by those who have dared to make learning both demanding and wonderful! This is an inspirational article! What a difference Trinity Schools makes in the world. Imagine the good that will be done for the Lord and His Kingdom by these wonderfully trained young men and women! Thank you, Lord! Our hats are off to you, Trinity grads!You are our hope for the future. Dear Trinity grads, we are so proud of you for attaining this important milestone in your lives. You have worked hard over the past 4 years to achieve something that will enable you to move forward with confidence in contributing to a world sorely in need of your gifts & talents, and especially your Christian values. We are counting on you to continue the work of building God's Kingdom wherever life takes you in the years ahead. Congratulations to each and every graduate and family that sacrifice and commit themselves to this undertaking! May each life be richly nourished and graciously given in service to others.